It's Sunday morning at 10:30 a.m., and a hot date is wrapping up in the South End of Burlington. Nope, it didn't involve a sweaty, swinging night at Club Metronome, or even live music. But there was some swinging, some sweating, some ropes and a few tunes. Tom LaBarge, 51, and Nancy Smith, 46, are putting on their street shoes after a session at Petra Cliffs Climbing Center & Mountaineering School. "We're hooked," says LaBarge with a big smile. He's referring not to their passion for each other but for their new, shared pastime of scaling artificial walls protected from the wind, snow and sun. "It's better than a standard gym workout — you use all your muscles, you get tired, and it's just fun," he says. The two are hardly alone in their infatuation with indoor climbing. According to Climbing Business Journal, the sport is growing at a rate of 9 to 10 percent per year, with more than 350 facilities now open in the U.S. As the New Yorker recently put it, "Climbing has turned into the new squash or tennis for a certain young professional set, projecting an air of health-conscious cool less frenetic than CrossFit and grittier than SoulCycle." New England hasn't been a center of the sport in the past; the Southeast dominates, with 22 percent of climbing walls nationwide, according to industry researcher IBISWorld. But more Vermonters could get swinging in 2016 — which, incidentally, happens to be the Chinese Year of the Monkey. "The media coverage of world-class athletes accomplishing some amazing feats has really helped grow the industry," says Tim Farr, membership and staff manager of Petra Cliffs. American rock climbers and social-media darlings Tommy Caldwell and Kevin Jorgeson, for instance, raised eyebrows — and then the profile of the sport of climbing — with their ascent of Yosemite's impossibly vertical Dawn Wall. Petra Cliffs and MetroRock Vermont in Essex report drawing new climbers to their walls every day. "The cost to get started is relatively inexpensive compared to traditional gym membership," says Farr. 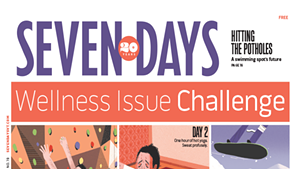 "Indoor rock climbing allows participants to come and experience an activity that may be unattainable outdoors because of cost, knowledge or location." After LaBarge and Smith leave Petra, I suit up for a private lesson with Sarah Fox, a 24-year-old Saint Michael's College graduate who coordinates the center's youth programs. I've previously dabbled in climbing, but on those occasions I struggled with my grip on the wall, and with trusting my feet. By 11 a.m., as the Church's "Under the Milky Way" plays, the gym is abuzz with climbers ranging from toddlers to septuagenarians. I approach a route graded 5.4 — relatively easy on the Yosemite Decimal System, which is used to rate the difficulty of climbs and hikes. Fox delivers a brief lesson in belaying, then serves as my belayer. She pulls up the slack on the rope that's attached to my waist by a carabiner, coaxing me up the holds marked with little pieces of green tape and advising me to "smear" my knee to the wall. I clamber to the top OK, and along the way Fox dispenses useful tips. One of the biggest misperceptions about climbing is that it's all upper-body oomph. Not so, says Fox, a longtime swimmer who turned to climbing after she tore her rotator cuff — proof that this sport doesn't require Superman shoulders. Instead, she continues, relying more heavily on legs, lungs and logic turns it into a flow-like experience. "Climbing is more about your legs," she says. "I tell this to women, especially. Lean back and use a straight arm — trust your skeleton." I'm feeling more low than flow as I move to a more difficult route, dotted with plastic holds called jugs, slopes and crimps that offer different levels of challenge to hands and feet. After only an hour or so of climbing, I'm fatigued enough to find my grip slipping on some of the trickier parts. But it's a good, post-workout feeling. "The physical benefits of climbing are being able to use the body as a whole while climbing and training," Farr tells me. "It requires a level of endurance and flexibility, in addition to a balanced level of strength, [that's] not emphasized much in other sports." "Being able to push your boundaries to accomplish a goal is amazing," says Farr of the mind-body rewards of rock climbing. He also reports working with new climbers to overcome a fear of heights. Anyone who thinks indoor climbing facilities are musty hangouts — another misconception about the sport, says Farr — will find the scene at Petra Cliffs a breath of fresh air. The upstairs loft has been cleaned and refurbished with treadmills and weights to augment climbing workouts, along with tables for the use of the Friday Night Kids Club and local climbing teams. 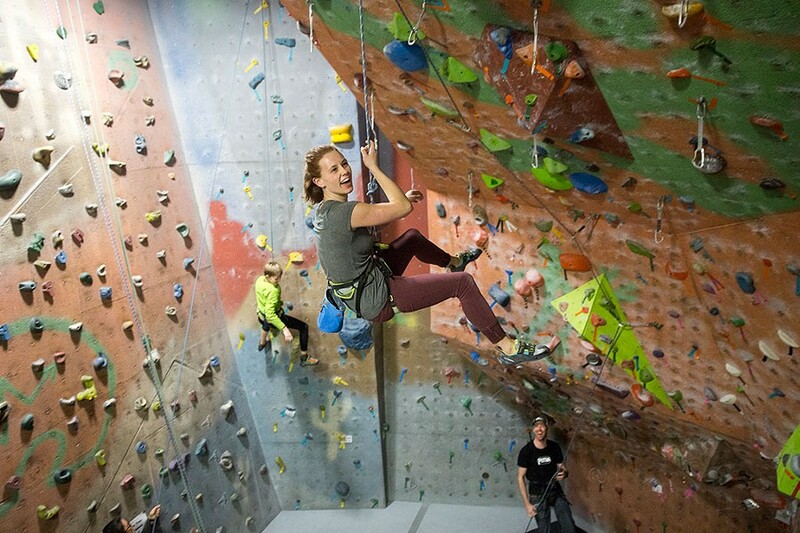 Revamped versions of the indoor ropes course and adjustable "crack wall," as well as a massive bouldering structure for climbing without ropes, make for a comfortable community gathering spot. Among the new classes Petra Cliffs offers this winter are women's indoor climbing clinics for beginners and intermediates, and three separate coed programs (hence LaBarge and Smith's hot date on a Sunday morning). MetroRock, meanwhile, has yoga sessions in addition to a curriculum that includes team building, adult training, after-school programs for kids and a new technique class called 5.9 & Beyond. 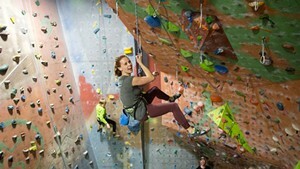 "With indoor climbing, you can come in and work on anything — flexibility, upper body, legs, your mental game," says Fox. If you don't come with a partner, you can always enlist a stranger to belay you — and perhaps make a friend. Besides offering physical training, the facility can be a sociable refuge for Vermonters who want to get out of their own homes in winter, Fox notes. "It's nice to have a place where you can come out of that bubble." Prefer to scale actual cliffs? The Smuggs Ice Bash happens Friday to Sunday, January 22 to 24. The event begins with a Friday Night Drytool Comp and Kickoff Party at Petra Cliffs, 6 p.m. $5. The original print version of this article was headlined "On the Rise"